Context: The diagnosis of polyneuropathy may be challenging at the early stages of the disease. Despite electromyography (EMG) efficacy in the establishment of polyneuropathy diagnosis, in some cases, results are dubious and neurophysiologists may implement additional techniques to ensure that conduction is affected. Aims: The aim of the study was to evaluate motor-evoked potential (MEP) characteristics in children with acute inflammatory demyelinating polyneuropathy (AIDP). Settings and Design: The study was conducted at a pediatric research and clinical center for infectious diseases. Subjects and Methods: Twenty healthy children (7–14 years old) without signs of neurological disorders were enrolled as controls. Thirty-seven patients (8–13 years old) with AIDP were enrolled as the main group. EMG and transcranial magnetic stimulation (TMS) were performed on the 3rd–7th days from the onset of the first symptoms. Statistical Analysis Used: Descriptive statistics and Student's t-test were used. Bonferroni method was applied to implement appropriate corrections for multiple comparisons. Results: Significant differences between children with AIDP and controls on latencies of both cortical and lumbar MEPs were registered. Cortical MEP shapes were disperse in 100% of the cases and lumbar MEPs were disperse in 57% of the cases. Conclusions: Diagnostic TMS on the early stage of the AIDP in children may be implemented as the additional tool. The main finding in this population is lengthening of the latency of cortical and lumbar MEPs. Disperse shape of the lumbar MEPs may be used as the early sign of the acute demyelization. The diagnosis of polyneuropathy may be challenging, especially at the early stages of the disease. Among the electrophysiological methods, electromyography (EMG) stays the first-choice method for peripheral nerve evaluation. Diffuse conduction velocity (CV) slowing, amplitudes drop, and F-waves disappearance are the main signs of ongoing peripheral nerve involvement. Despite EMG efficacy in establishment of the polyneuropathy diagnosis, in some cases, results are dubious and neurophysiologists may implement some additional techniques to ensure that conduction is affected. For example, tourniquet probe and threshold tracking techniques were implemented with analysis of reactivity of nervous conduction. The main setback of these methods is that it is time-consuming and sometimes hard to perform, especially in pediatrics. Transcranial magnetic stimulation (TMS) is a method for noninvasive brain stimulation, which is based on the principle of electromagnetic induction. TMS is an effective diagnostic and therapeutic technique which may provide valuable insights into developmental neurology and neurophysiology in pediatric population., In children with inflammatory lesions of the nervous system, for example, acute transverse myelitis, TMS may serve as a diagnostic and prognostic tool. In the study specifically dedicated toward the TMS findings in acquired inflammatory demyelinating neuropathy in adults, the authors report that increase in motor-evoked potential (MEP)/wrist compound muscle action potential (CMAP) ratio was better correlated with improvement in muscle strength than with change in the axilla or Erb's point CMAP/wrist CMAP ratio. The authors assume that maximal MEP size can be used to predict proximal motor nerve conduction abnormalities. Furthermore, MEP characteristics were used to differentiate between demyelinating and axonal polyneuropathy. Among the 53 patients with primary axonal involvement and 54 patients with demyelinating polyneuropathy, only three had normal MEPs. MEPs in “demyelinating” patients showed significantly longer peripheral conduction times, larger interside differences, and lower amplitudes than the “axonal” patients. The authors conclude that TMS may be implemented to perform such traditional nerve conduction studies task as axonal/demyelinating process differentiation. In industrial n-hexane polyneuropathy, TMS revealed slowing of central motor conduction time (CMCT) and lengthening of the spinal and lumbar MEP latencies. To the best of our knowledge, there are no reports on MEP characteristics in children with acute inflammatory polyneuropathy. Thus, we conducted our study to evaluate TMS efficacy as a diagnostic tool in children with acute inflammatory demyelinating polyneuropathy (AIDP). The aim of the study was to evaluate MEP characteristics in children with acute inflammatory polyneuropathy and evaluate usefulness of TMS as an additional method of diagnostic in this disorder. Twenty healthy children (7–14 years old, average 12 years, 7 females, 13 males) without any neurological signs were enrolled as control group. The main group consisted of 37 patients (8–13 years old, average 11 years, 19 females, 18 males) who were presenting with the complaints on muscle weakness, sensory disturbances, and inability to walk. All patients were thoroughly investigated by a neurologist; polyneuropathy was suspected. Immediately after that, all patients underwent electrophysiology studies: EMG and TMS. Later on, with the clinical course of the disease, AIDP was established according to the Brighton diagnostic criteria. On consequent EMGs on the 14th and 30th days of the disease, demyelinating lesion of the nerves was registered in all patients. EMG was performed according to the currently accepted standard procedures. CV, residual latencies, and amplitudes of CMAPs were recorded for the Nervus Tibialis, Ulnaris, and Medianus, and sensory nerve action potential amplitude and CV were recorded for Nervus Ulnaris, Peroneus superficialis et Suralis. F-waves from all aforementioned motor nerves were studied. Residual latency was evaluated instead of distal latency as limbs of children may vary in length; residual latency is more reliable in this population. Single-pulse TMS is routinely implemented to study corticospinal tract characteristics. We used single-pulse TMS protocol. TMS was performed according to the currently accepted standard protocols. Children were seated in a chair. 90 mm circular coil for Neuro-MS-D monophasic current pulse magnetic stimulator was used. Coil was positioned over the optimal site on the scalp. Coil was placed over the vertex for the stimulation of the hand control area of motor cortex and 5 cm in front from that area for the leg motor cortex area. MEPs were evoked and afterwards CMCTs were calculated according to standard accepted procedures. The target muscles (musculus abductor hallucis) in our study were contracted (facilitation was performed). At least five single-stimulation responses were collected, averaged, and analyzed with measurement of MEPs amplitude, duration, and onset latency. Surface skin-mounted EMG electrodes (8 mm in diameter) were placed over musculus abductor hallucis, with EMG signal being registered by Neuro-MVP EMG system. The study was performed in the well-lit room with a constant controlled air temperature (average 24°C). TMS was performed on the 3rd–7th days after the onset of the first symptoms, average on the 6th day (standard deviation 2.4 days). The study was approved by the Local Ethical Committee according to the Helsinki declaration. The purpose of the study was fully explained to the participants, their parents, or legal representatives; written informed consent was obtained from all patients' parents or legal representatives. Obtained values were compared between groups. Statistical analysis was performed using standard statistical analysis software for Windows. Descriptive statistics were used for the demographic characteristics of the cohort, and Student's t-test was used for normally distributed parameters in group comparisons. P < 0.05 was considered statistically significant. Bonferroni method was applied to implement appropriate corrections for multiple comparisons. Statistical analysis and data processing were carried out using the software IBM SPSS Statistics, version 22 (Microsoft Company, USA). EMG parameters (residual latency, amplitudes and CV of the motor fibers of the ulnar, median, and tibial nerves and CV and amplitudes in nervus peroneus superficialis, nervus Suralis, and sensor fibers of Nervus Ulnaris) of the patients and controls are presented in [Table 1] and [Table 2], respectively. There was a tendency toward longer F-waves latency in AIDP group on the 3rd–7th days of the study, but it was no significant; later on, when investigated on the 14th–15th days of the onset symptoms, F-waves were absent in all patients. TMS parameters (cortical MEPs latencies, amplitudes, CMCT and lumbar MEPs latencies and amplitudes) of the patients and the control group children are presented in [Table 3] and [Table 4], respectively. As it may be seen from the data presented, significant changes were registered in children with polyneuropathy as compared with controls on latencies both cortical and lumbar MEPs. There were no significant differences in latency lengthening between sides. MEPs changes were registered in thirty patients (81%): amplitudes lowering of the cortical MEPs on both legs were seen in 26 children (70%), latency lengthening in 22 (59%); cortical MEP shape was disperse in all 24 patients, in whom they were registered. Cortical MEPs were absent in 13 patients. Typical changes of the MEPs in children with AIDP are shown in [Figure 1]. Lumbar MEPs were registered in all patients. Amplitude lowering was seen in 31 patients (84%) and latency lengthening in 20 (54%). Shape of the lumbar MEPs was disperse in 21 patients (57%). As our data indicate, there are significant differences between children with acute demyelinating polyneuropathy and controls on latencies of both cortical and lumbar MEPs. This may reflect demyelinating nature of the disease and general slowing of the conduction along the peripheral nerves even on this early stage of the disease. In cases in which cortical MEP was registered, it was disperse. Such MEP may reflect demyelination process in corticospinal tract. Cortical MEP may be polyphasic in early childhood due to incomplete myelination of the central motor pathways. In our population, lumbar MEPs were also disperse in 57% of the cases. Lumbar MEP shape is comparable with adults even in the preterm infants. Thus, this finding may be attributed to the altered conduction along the peripheral nerves due to their inflammation. Changes of the shape of lumbar MEP may be used as the additional sign of demyelization of the peripheral nerve, and as this MEP may be easily elicited even in preterm infants, this parameter may be used for additional diagnostic in young children where cortical MEPs are hard to elicit. There were no significant differences in latency lengthening between sides. Such finding well corresponds with the diffuse nature of the inflammation of the peripheral nerves in the disease studied. 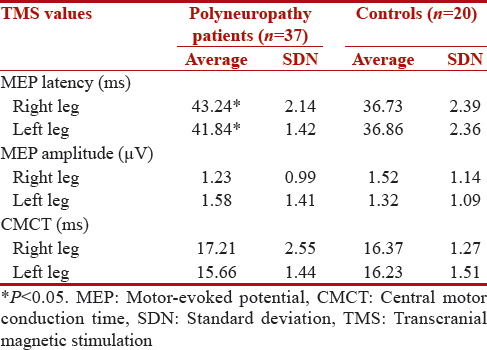 Acute demyelinating polyneuropathy may affect not only peripheral nerves but also central nervous system., Slowing of CMCT in patients with this disease may be expected. In our study, despite some tendency toward longer CMCT in the affected children as compared to controls, differences were not significant. It may be due to the early stage on which CMCT was measured. 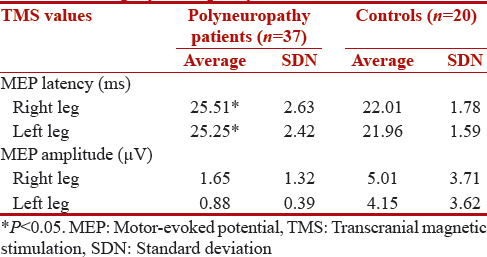 The absence of the measurements of the CMCTs in children with acute demyelinating polyneuropathy on the later stages of the disease is the limiting factor of our protocol; its implementation in the future studies may significantly improve them. One of the limiting factors of our protocol is also that we did not study MEPs from other muscles which may be informative in AIDP, for example, musculus tibialis anterior. There are no doubts about the main role which conduction studies and EMG play in the establishment of acute demyelinating polyneuropathy in adults and children. With our study, we needed to stress the importance of implementing additional tools which may improve the diagnostic process on the early stages of the disease, when electrophysiology findings may be doubtful and clinician needs reliable answer on the nature of the disorder. Thus, sensitivity of diagnostic TMS in the early stages of the disease was 81%. Specificity of TMS was 90% and positive prognostic value was 89%. These values lead to the conclusion that in early stages of AIDP, diagnostic TMS has to be used together with EMG (nerve conduction studies with its 54.3% sensitivity, 72% in special criteria), and then these two methods will add to the sensitivity and prognostic value of each. Our study has some certain limitations. First, amplitude and latency of MEPs, especially in children, have wide degree of variability. Also, it should be pointed out that usual method of CMCT calculation does not show a real central motor conduction, as it includes a conduction time in the cauda equina. To exclude this component of the motor pathway, cortico-conus conduction time measuring method was reported recently. Implementing this novel method of diagnostic in children with AIPD may be promising in the future studies. Thus, diagnostic TMS on the early stage of the acute demyelinating polyneuropathy in children may be implemented as the additional tool. The main finding in this population is lengthening of the latency of cortical and lumbar MEPs. Disperse shape of the lumbar MEPs may also be used as the early sign of the acute demyelization of the peripheral nerves. Triggs WJ, Cros D, Gominak SC, Zuniga G, Beric A, Shahani BT, et al. Motor nerve inexcitability in Guillain-Barré syndrome. The spectrum of distal conduction block and axonal degeneration. Brain 1992;115(Pt 5):1291-302. Bostock H, Cikurel K, Burke D. Threshold tracking techniques in the study of human peripheral nerve. Muscle Nerve 1998;21:137-58. Barker AT, Jalinous R, Freeston IL. Non-invasive magnetic stimulation of human motor cortex. Lancet 1985;1:1106-7. Frye RE, Rotenberg A, Ousley M, Pascual-Leone A. Transcranial magnetic stimulation in child neurology: Current and future directions. J Child Neurol 2008;23:79-96. Nardone R, Höller Y, Brigo F, Orioli A, Tezzon F, Schwenker K, et al. Descending motor pathways and cortical physiology after spinal cord injury assessed by transcranial magnetic stimulation: A systematic review. Brain Res 2015;1619:139-54. Voitenkov VB, Klimkin AV, Skripchenko NV, Pulman NF, Ivanova MV. Diagnostic transcranial magnetic stimulation as a prognostic tool in children with acute transverse myelitis. Spinal Cord 2016;54:226-8. Zambelis T, Panas M, Kokotis P, Karadima G, Kararizou E, Karandreas N. Central motor and sensory pathway involvement in an X-linked Charcot-Marie-Tooth family. Acta Neurol Belg 2008;108:44-7. Cruz Martínez A, Tejada J. Central motor conduction in hereditary motor and sensory neuropathy and hereditary spastic paraplegia. Electromyogr Clin Neurophysiol 1999;39:331-5. Mano Y, Nakamuro T, Ikoma K, Takayanagi T. Central motor conduction time (CMCT) in hereditary motor sensory neuropathy type I (HMSN type I). Rinsho Shinkeigaku 1990;30:487-91. Inaba A, Yokota T, Saito Y, Ichikawa T, Mizusawa H. Proximal motor conduction evaluated by transcranial magnetic stimulation in acquired inflammatory demyelinating neuropathies. Clin Neurophysiol 2001;112:1936-45. Takada H, Ravnborg M. Magnetically evoked motor potentials in demyelinating and axonal polyneuropathy: A comparative study. Eur J Neurol 2000;7:63-9. Oge AM, Yazici J, Boyaciyan A, Eryildiz D, Ornek I, Konyalioglu R, et al. Peripheral and central conduction in n-hexane polyneuropathy. Muscle Nerve 1994;17:1416-30. Fokke C, van den Berg B, Drenthen J, Walgaard C, van Doorn PA, Jacobs BC. Diagnosis of Guillain-Barré syndrome and validation of Brighton criteria. Brain 2014;137(Pt 1):33-43. Gregory LH, Solomon LM, Royden HJ. Clinical Neurophysiology of Infancy, Childhood, and Adolescence. Philadelphia: Elsevier Inc.; 2006. p. 858. Rajapakse T, Kirton A. Non-invasive brain stimulation in children: Applications and future directions. Transl Neurosci 2013;4:128-37. Banakar BF, Pujar GS, Bhargava A, Khichar S. Guillain-Barre syndrome with posterior reversible encephalopathy syndrome. J Neurosci Rural Pract 2014;5:63-5. Barisic N, Grkovic L. Long term clinical and electrophysiological assessment of Croatian children with corticospinal tract involvement in Guillain-Barré syndrome (GBS). Eur J Paediatr Neurol 2010;14:391-9. Bradshaw DY, Jones HR Jr. Guillain-Barré syndrome in children: Clinical course, electrodiagnosis, and prognosis. Muscle Nerve 1992;15:500-6. Kiers L, Cros D, Chiappa KH, Fang J. Variability of motor potentials evoked by transcranial magnetic stimulation. Electroencephalogr Clin Neurophysiol 1993;89:415-23. Matsumoto H, Hanajima R, Shirota Y, Hamada M, Terao Y, Ohminami S, et al. Cortico-conus motor conduction time (CCCT) for leg muscles. Clin Neurophysiol 2010;121:1930-3.